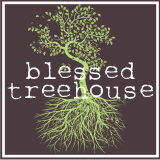 Blessed Treehouse: Woot. Woot. Wooster. Recently we made the hike up to Wooster, Ohio to visit my Dad at work. He works at Ohio State's Agricultural Technical Institute, and during our visit we took Henry to see the animals. He loved snuggling up to the calves, and he even spent 10 seconds on top of a mule. Unfortunately there was a lot of commotion while he sat atop the mule, so I didn't get a very good picture. Though we left the farm covered in mud and manure, it was great to see the joy on Henry's face as he experienced farm life firsthand.